Gary is a local highly regarded birder and professional biologist was scanning the large ponds that are east of Clam Beach and south of the highway 101 Vista Point overlook. He noticed a bird that was definitely not an endemic species and later reported it to the Humboldt County Birder alert as a Brown Shrike. In the ensuing days word got out to the bird community as fast as lightning and the Shrike rush was on. Birders from all over the country began to show up to get a glimpse of this very rare bird. Even local birders became addicted to it as they returned sometimes daily or weekly just to see it again or photograph it. People who chase birds must be reasonably successful in life because it requires time and money to travel great distances to add a new bird to one's life list. According to an article in USA Today American birders spend over 32 billion annually on their hobby and 18 million to travel inorder to see birds. A 2001 study by USFW found that the average age of birders is 49 with above average income and education level. I met several birders while looking for the Shrike who had traveled from as far away as Boston, MA, Washington State, Arizona and Oregon. on the market and clothed in Gortex raingear and waterproof footwear. Most were friendly but serious and dedicated to their passion of chasing birds. Birders are collectors in a sense because each new bird is another notch on their lifetime list. Many bird chasers are also competitive as well and each new bird gives them bragging rights to their peers. often with "High Fives", handshakes, and even Tiger Woods like fist pumps. Others may calmly display a sigh of relief for all their efforts and move on to the next challenge. The second time that I was out looking for it I ran into a legend in Humboldt County by the name of Dr. Harris a retired professor at Humboldt State University. He was there with his adult son sitting atop one of highest foredunes scanning the leafless alders hoping to add this bird to his list of Humboldt County birds which tops all other birders. Neither of us spotted the shrike on that day even though we scanned the habitat patiently for well over an hour. On the third time that I went out to look for it there were several people who had it in their scope making it easy for me. While talking to a lady from Sonoma County I mentioned an old friend (Mike Parmeter) who greatly influenced me when I was a boy scout in Guerneville, California. He became a Medical doctor and one of the best birders in California and co authored "Birds of Sonoma County, California" with the late Gordon Bolander. She knew Mike and we talked about him and birds briefly while walking toward the birders who arrived before us to see the Shrike. I mention this to point out that birders often meet new people while chasing birds and it becomes a social gathering of sorts. As I write this the Brown Shrike has stayed put for over 6 months and apparently finds the area a good place for food and cover. This bird has undoubtedly affected our local economy in a positive way since birders who come here most likely use a local motel and restaurants if they stay more than a day. This years annual "Godwit Days" celebration was a huge success with most all birding trips sold out. One of the big drawing cards was the possibility of seeing the Brown Shrike and to add it to their Life list. A good friend of mine and highly regarded naturalist and birder Wayne Laubscher who works with this years keynote speaker Scott Wiedensaul banding Saw Whet Owls in Pennsylvania came out for Godwit days. Wayne was excited about the possibilties of seeing many new birds and ended up with 20 including the Brown Shrike and Spotted owl. In constant rain we followed by car our leader Keith Hamm a Associate biologist with Green Diamond up a mountain road for several miles. 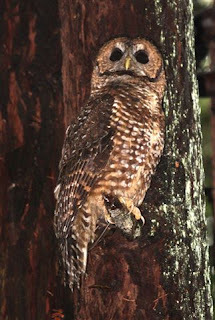 About 12 enthusiastic people in rain gear trudged up a slippery slope in riparian mature forest to get a glimpse of the owl that has created controversy amongst environmentalist and the logging industry for over 30 years. 20 years. He told us that most all the owls in this large area owned by Green Diamond have been banded and he knew exactly where to find the owl that we were about to see. He first mimiced the call of the owl with a dog like barking described by Sibley as "whup, hoo-hoo, hooo". Within seconds his sharp eyes picked up the owl that most of the group didn't notice because of it's cryptic coloration making it almost invisible. He then placed a white lab mouse on the end of a small twig and held it up high above his head. Within seconds the owl swooped in so close that we could feel the breeze of the silent wing beat as it snatched up the mouse and took it to a nearby branch. One gentleman from Southern California was almost in tears from the overwhelming emotion of seeing the owl for the first time. an umbrella over him as he photographed the owl. hold the stick with another mouse on it. Someone should have gotten a photo of the boys expression when the owl again swooped down and deftly plucked the mouse from its perch and flew to a nearby branch. An experience that this boy will likely remember the rest of his life. by Gary Lester who originally found it. Gary Lester with a trip participant looking for the Brown Shrike. The ponds where the Brown Shrike has remained for nearly 6 months in Mckinleyville, California. The Shrike was found and all the participants excluding Gary and myself had added another bird to their life list. I had a great time and it was good to see a friend from our days living in Pennsylvania once again. I must add that I am not a "Bird Chaser" and most likely would not fly across country to see a new bird. However, I love seeing new birds and appreciate them from a different aspect and marvel at their diversity, beauty and the many adaptations that have evolved through natural selection. Shrikes, in general, are my favorite of the passerines. Lottsa good info there, Terry, and congrats on the brown shrike. I think they are broadly Eurasian in distribution and I've seen them in India/Nepal/Burma as winter migrants. 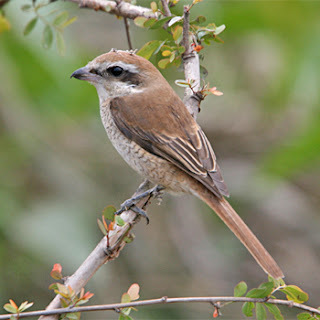 Alas, that Brown Shrike could be quite lonely being so far from his (?) native home without a mate . . . except for the countless birders always focused on him. Great post! Chris you reminded me that I forgot to add the link to the Brown Shrike. It's done now! Very interesting blog! I like birds and would never "chase" them.